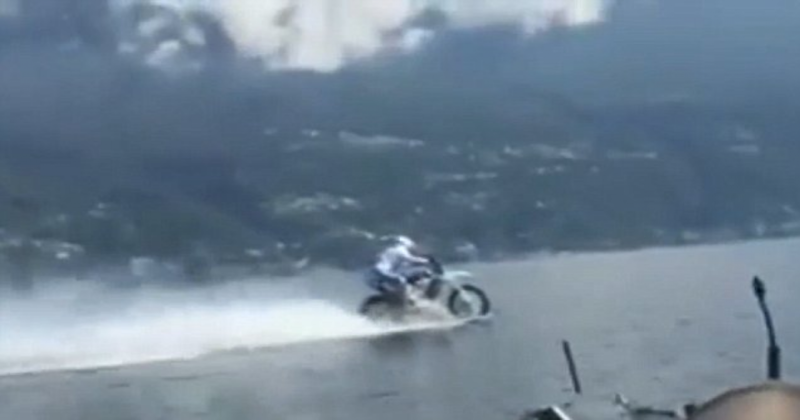 Daredevil Rides A Motorbike On Water Surface Across A Lake And Conquers It. Cars are for land, planes are for air, boats are for water. Bit this dirt bikes are for all three. You may not be sure about the "water" part either until you saw this insane video. The video was presented as if it showed an ordinary motorcycle “defying the rules of physics,” and it is real, inasmuch as it was not tampered with or altered. Here in this video, you can see the man only with an inflatable bracelet, capable of expanding like a life-jacket, the Italian rode at breakneck pace at the water and hydroplaned his way across in just five minutes. Luca’s bike, a Suzuki RMZ 450, was specially adapted by Vercar Moto to be able to deal with the pressures of hydroplaning and make it less likely to sink. It was equipped with nautical skates and with special rubber blades that provided the hydrodynamic thrust and gave it buoyancy.